also introducing the shiniest of shiny shoes. they are so perfect, and so comfy too. i've always been a flats girl, you may have noticed that even when i do wear a heel it's always a mid-heel, and always a chunky heel. (one of my pet hates is kitten heels, i truly despise them). on a day-to-day basis i'm in flats i'd say 95% of the time. and these are the best addition to my collection! just noticed i'm looking down in all these photos. i have no idea why. 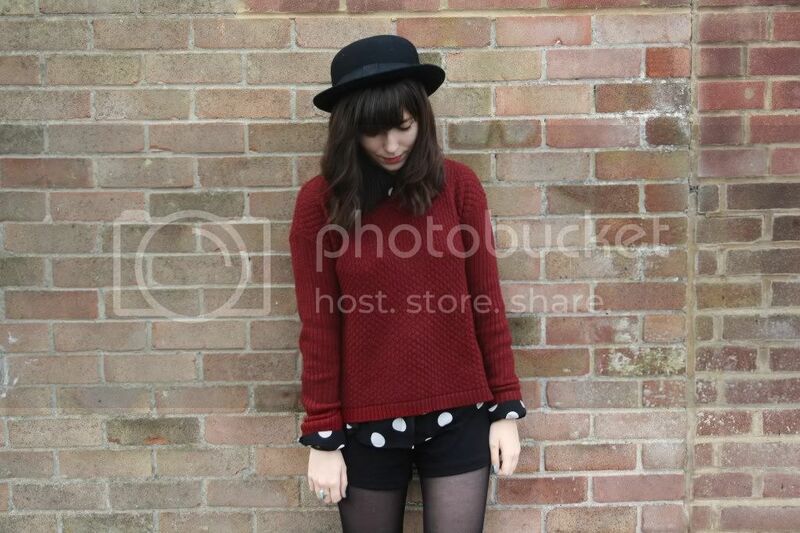 I love this outfit...particularly love your jumper! New Look has become my go-to winter jumper store. Loving the little hint of polka dots too. Also agree with you on the kitten heels front...they're so annoyingly wobbly that I'd sooner wear stilettos! Polka dots and burgundy hue are my most favorite combination. Super cute! Take one Top Celebrity Stylist, add LA’s Newest and Coolest Jewelry Brand, mix in Santa Monica’s Hottest Fashion event of the year and you have Linda Medvene demonstrating how to wear ULINX Jewerly at the fabulous Zero Minus Plus at Fred Segal. Gorgeous outfit, the shirt & jumper together are so lovely! I bought a burgundy jumper last week... You've just given me a great idea to wear it. The shirt is so beautiful... I love dots is a season trend! The shade of burgundy goes so perfectly with your dotted shorts! <3 Love love love! This is such a wonderful look. Loving the patent shoes! Keep shopping - we love it. That short looks GREAT! Kitten heels are wobbly? I've never worn heels before as I'm more of a flats girl. And I've been searching for heels. Maybe I should wear wedges instead. I love your jumpers. They don't sell jumpers where I live, so I can only go op shopping to find them! Also, I really really like your shiny brogues! Definitely love every single outfit on your blog. 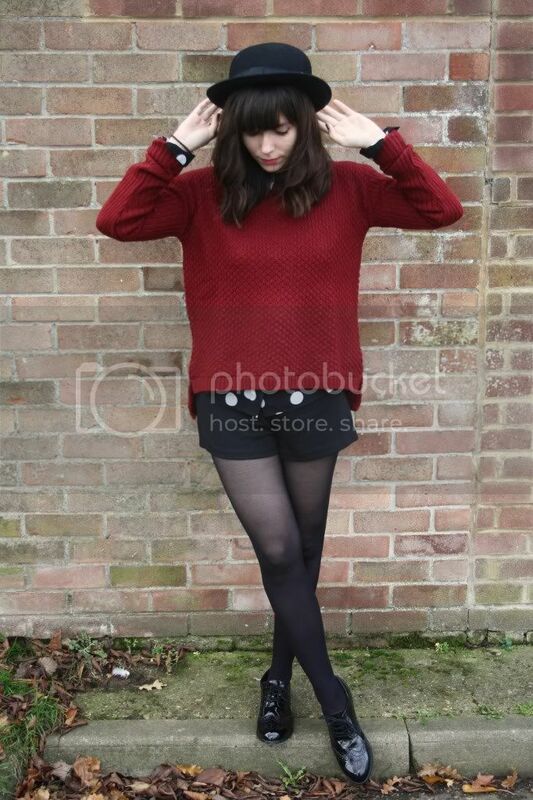 Really love this outfit!The jumper is nice! 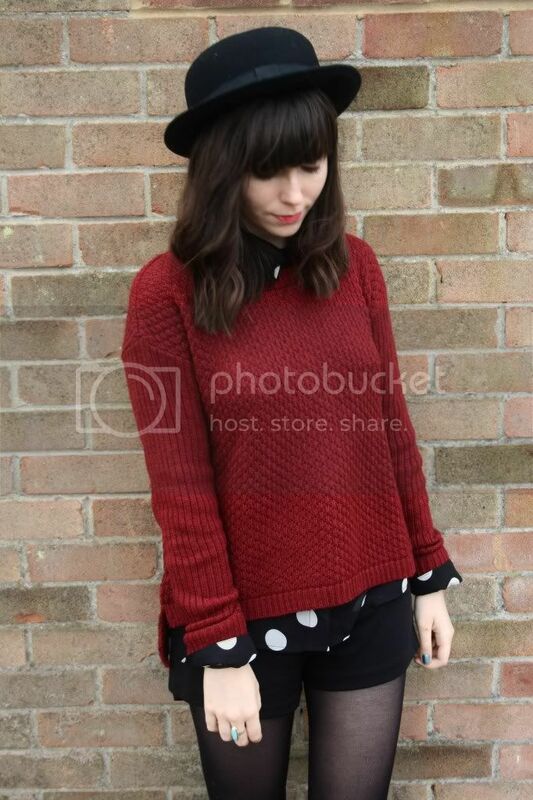 I love the polka dot blouse and the patent brogues. Great outfit! I can't go past anything burgundy at the moment. Lovely jumper! Burgundy is definitely your colour :) so pretty. I've just started my own Lifestyle and Beauty blog, would be great if you could check it out and follow if you like what you read! I really enjoy the peek of polka dots from underneath the sweater. Those patent shoes are pretty fantastic too! i love your jumper !! I really love the color of your jumper. Oh, I love this outfit! The burgundy is great, and of course polka dots are always fantastic.